This is not a typical zombie story. As in it's not mindless, flesh-eating monsters that are stumbling around. It's closer to the type of zombies in that awesome iZombie show on tv. It makes it even better that the zombie in this story is a little old lady that refuses to accept that she is dead. 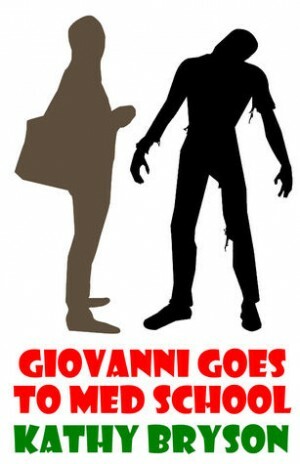 Giovanni is medical school with the dream of being a doctor but for now, he's working in the morgue. When one night a little old lady is wheeled in everything gets weird. She's not quite as dead as they thought she was and when she sits up and starts talking Gio doesn't know what to think. I thought this was an interesting story with potential to be an entertaining series. There were things that got me, though. Like, how were so many people in on the fact that there were people coming back from the dead and walking around the morgue? Was Gio actually dreaming because this seems like one of those stories where it was all just a dream. If you're looking for a short, fast, entertaining story then this might be for you. I really enjoyed reading it and it even made me laugh a time or two.